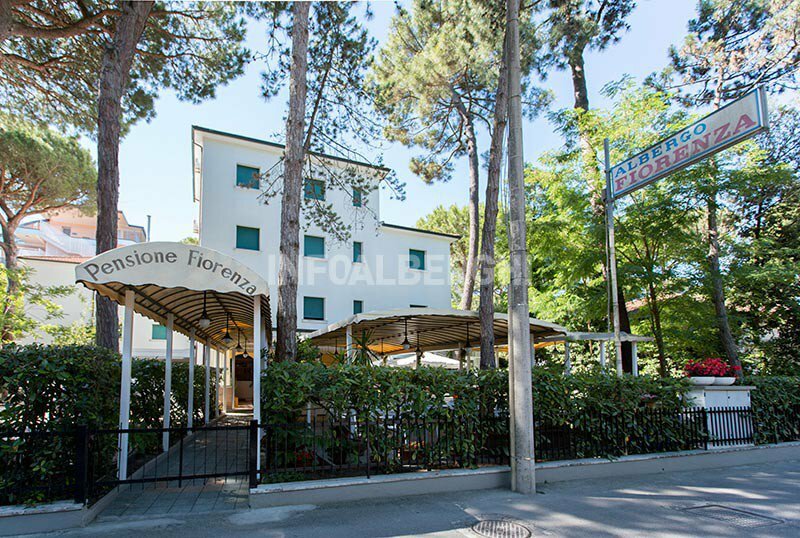 Hotel Fiorenza , located in a quiet area surrounded by greenery, is a 2-star family-run hotel near the beach of Milano Marittima. It offers renovated air-conditioned rooms, a garden, parking and free WI-FI. Animals are not allowed. The hotel is located in Milano Marittima, in a quiet tree-lined street from which you can walk to the sea in a couple of minutes. The central area of Milano Marittima, with its bars, restaurants and shops, is less than a 5-minute walk away. Mirabilandia amusement park can be reached easily either by public transport or by car. Recently renovated, they are all equipped with color TV, telephone, WI-FI, safe, air conditioning and private bathroom with hairdryer and shower. FAMILIES: solutions are available for large families with multi-bed and / or connecting rooms. Garden with covered open-air porch, free use of bicycles, TV lounge and reading with newspapers, bar and lift. Theme nights are organized. BREAKFAST: sweet and savory served buffet style in the outdoor breakfast room. LUNCH AND DINNER: multi-choice menu with both meat and fish dishes and buffet side dishes. Water with meals is included. OTHER: every Thursday aperitif in the garden and typical local dinner with local specialties. In the hotel: outdoor playground area and entertainment. At meals: seats at the table, dedicated menus and baby food. The hotel has an agreement with the nearby Bagno Ippocampo beaches n. 277 and Bagno Corallo n. 279 equipped with showers, cabins, WI-FI connection, catering area, fenced baby park, playgrounds, entertainment and baby room with changing table. Prices for Full Board and Half Board are per day per person for a minimum stay of 3 nights. In formula B & B, price starting from € 34 per person per day. Special promotions for May and June, 6-night stay in Formula All Inclusive. From 26 May to 1 June, starting from € 320.00 per person. From 16 to 22 June, starting from € 375.00 per person. Book your summer vacation now. Special promotions for August, 6-night stay in Formula All Inclusive. From 25 to 31 August, starting from € 400.00 per person. Book your holiday in Milano Marittima now. Special promotions first week of September, 6-night stay in Formula All Inclusive. From 1 to 7 September, starting from € 330.00 per person. Book your stay in Milano Marittima now.